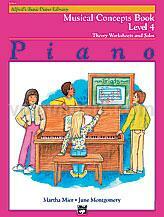 The Musical Concepts Book may be used after the student completes the Lesson Book to serve as an excellent review of important new concepts. Each of the 11 units consists of a two-page theoretical explanation and worksheet on a specific concept followed by an enjoyable solo to demonstrate and reinforce each new concept. A valuable and important follow-up to better understand the most important concepts.